Chrystia Freeland, global editor at large for Reuters, reviewed a book that suggests capitalism has something to learn from the NFL; it is the duty of society to ensure that the rules of capitalism are working for the common good. The NFL continuously tweaks the rules of the game to make sure the collective outcome is right. Freeland comments on how there is a huge audience for books about improving business that concentrate on those businesses but that ignore their wider impact. Fortunately, there is an entire body of knowledge and practice that does just that. A systemic approach to management and economics has the goal of the common good inherently inbuilt. That is what makes it the most fitting paradigm and method for any enterprise that aims to be sustainable economically, morally and ethically. Moreover, within this paradigm, continuous improvement is based on a scientific feedback cycle of plan, study, thus avoiding ‘tweaking’ that could be tantamount to perilous ‘tampering’ with the system. Why is it that systemic management automatically takes into consideration its environment, both human and otherwise? It is because any organization is an open system, and continuously interacts with its environment. This awareness alone places any leadership and management decision within the wider scope of input and output, what the organization receives and what it delivers, both internally and externally. Every organization, in this sense, is potentially a social enterprise. We can see this from W. Edwards Deming’s famous illustration of Production Viewed as a System, clearly connecting the outside system of suppliers and customers with what goes on inside the organization. It is relevant to any organization, well beyond manufacturing. So how can we avoid tweaking and be sure that the decisions and actions we take will not be tampering with our system? We do that through an aspect of management that perhaps more than any other defines the sustainability of an enterprise: Quality. Toyota built its reputation on Quality and is today paying the price for letting that priority slip. In larger enterprises, Quality may be relegated to a function, a department, or simply a set of regulations imposed by a Certification process. Instead, Quality, no matter the size of a company, has to be something well beyond a technique. It has to be a mindset, an attitude, and it has to be monitored, measured and addressed continuously. How do we do this? By understanding the processes that make up our organization, and the variation that affects them. – Do they make the coffee or does some other family member make it? – Is the bathroom free or do they have to wait to get in? – How long do they stay in the shower and how long will they take to get dressed? The list goes on, and the arrival time depends on how these simple actions, with their associated variation, are combined together. Why can’t any process be standardized so that no variation is allowed? It is because in nature there is a ’variable’ called Entropy that accounts for the variation associated with every process. Any organization, or system, is naturally affected by the increase of Entropy. The day-by-day repetition of simple actions at our work place will never be the same because of the natural increase of Entropy. Variation affects all the processes in our organizations. As Dr. Deming tells us, the essence of management is prediction; so for leaders and managers to do their job they must ensure a stable and predictable environment. In other words, the job of leaders and managers is to reduce variation. Reducing variation starts with mapping the processes in our organization (see Creating, Operating and Getting Results with the Enterprise as a Sustainable System) so we can understand the interdependencies. We then choose key points in processes to monitor, and we gather the relevant data. With this data we can build Process Behaviour Charts (Control Charts) that allow us to extract meaningful information from our data. We will be able to detect if our processes are in statistical control, and if they are not we will know where we have to take action. It is a relentless and rigorous process, and it can make the difference between success and failure. When we do not understand our processes, when we do not know if they are predictable or not, we may be producing good results, but if our processes are not stable and predictable, we have no idea of what will happen tomorrow. And we have no idea of what effect our process are having beyond our own business. If only BP and their operations in the Gulf of Mexico had known this, we’d be in a different world today. P.S. 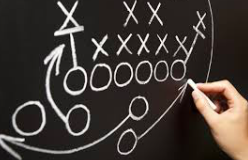 We, like the NFL, also use a Playbook in Intelligent Management. It is a detailed and rigorous mapping of all the interdependencies that make up our organization/system, allowing us to monitor and improve them in a predictable way. For a more in-depth look at Leadership and the Systemic approach to management see our book ‘ ‘Quality, Involvement, Flow: The Systemic Organization’ from CRC Press, New York. Sign up to our blog here and shift your thinking towards broader, systemic possibilities for yourself and your organization. Intelligent Management provides education and training on systemic management, W. Edwards Deming’s management philosophy and the Theory of Constraints (Decalogue methodology) in North America and Europe. Angela Montgomery Ph.D. is Partner and Co-founder of Intelligent Management and author of the business novel+ website The Human Constraint that has sold in over 20 countries. She is co-author with Dr. Domenico Lepore, founder, and Dr. Giovanni Siepe of ‘Quality, Involvement, Flow: The Systemic Organization’ from CRC Press, New York. Originally published at www.intelligentmanagement.ws on January 26, 2018.